Artillery of the Turkish army on Wednesday hit the Kurdish town of Derbassiye in Syria’s northeastern Hasakah province, shutting down the road between Derbassiye and Serikaniye. Furthermore, clashes broke out between Kurdish fighters of the People’s Protection Units (YPG) and the Turkish military near the town of Afrin. “The Turkish army is targeted the positions of the YPG in Derbassiye and our units responded to the sources of fire intensively,” said Abdulkarim Omer, head of the foreign relations office at the Cezire (Hasakah) canton. “An armed Turkish soldier was killed and three others wounded when the YPG confronted the attack by the Turkish occupation army on Derbassiye,” he added. 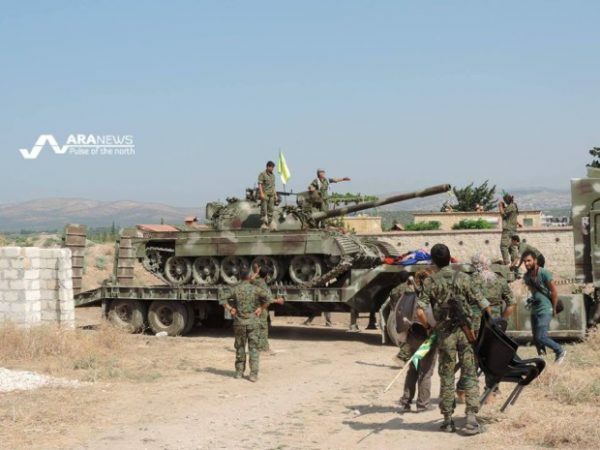 “Continuing their aggression, the Turkish army and allied gangs shelled town of Till Rifaat and the village of Til Cibrîn in Shahba region,” the YPG said in a statement. “The MMC [Manbij Military Council] declared its full support for YPG/YPJ forces against Turkish attacks, noting that Turkey aims to obstruct the fight against Daesh [ISIS,” the YPG added. This comes a day after the Turkish jets killed over 25 Kurdish fighters in Iraq and Syria on Tuesday. “Clashes between the People’s Protection Units [YPG] and the Turkish army in Derbassiye continue,” reported Jesper Söder, a Western volunteer with the Kurdish-led Syrian Democratic Forces (SDF). In order to protect the safety of the citizens, the Kurdish People’s Protection Units (YPG) cut off roads in the area of clashes between Derbassiye and Serekaniye. “The YPG forces targeted a tank belonging to the Turkish army that was trying to enter the territory of Rojava,” he added. Moreover, clashes took place close to the town of Efrin, but no Turkish air strikes were reported. “We believe that our partner forces were struck in northern #Syria, and our Peshmerga partner forces were struck Sinjar Iraq,” Col Dorrian added. “Our partner forces have been killed by Turkey strike, they have made many sacrifices to defeat ISIS,” the American Colonel said. “We are troubled by Turkey airstrikes on SDF and Kurdish forces,” he added.